(NEW YORK) - The results are in - dog owners agree that their four-footed friends should be as safe and comfortable in a vehicle as their two-footed fellow passengers. Dog owners also rate clip-in harnesses and non-spill water dispensers as the most appealing dog-friendly accessories in a dog-friendly vehicle1. 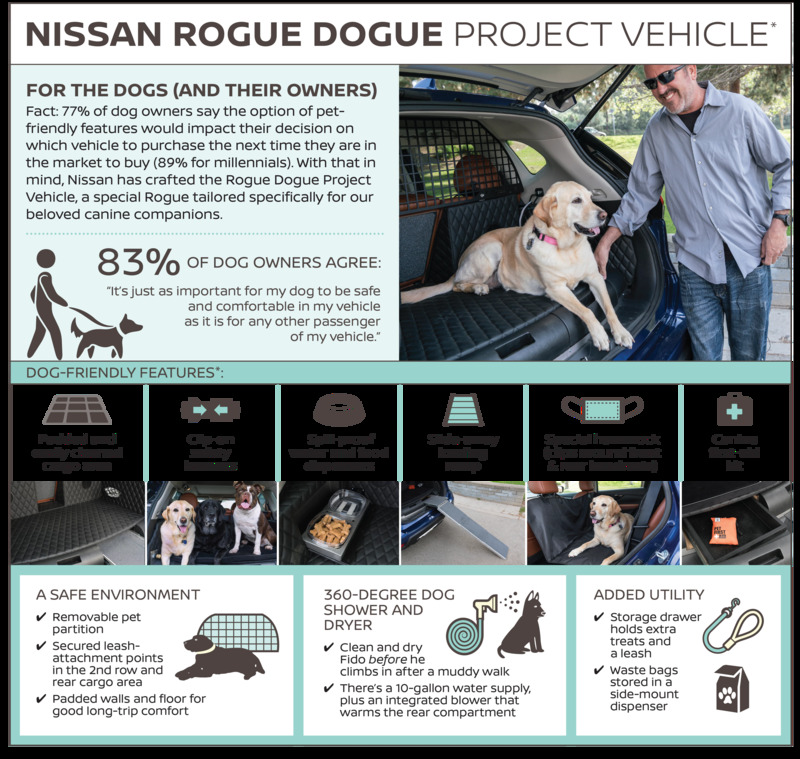 The new Nissan "Rogue Dogue" project vehicle takes those ideas to heart - and adds a pack more - just in time for the one-off project's debut at the 2017 New York International Auto Show. "For all of the dog lovers at Nissan, the Rogue Dogue is so much fun - the equivalent, I guess you could say, of riding with your head out the window if you were a dog," said Michael Bunce, vice president, Product Planning, Nissan North America, Inc. "Of course, we also take pets' safety very seriously, which is why the Rogue Dogue includes secure leash fastening attachments in the second row and rear cargo area - along with numerous other features designed to make family travel with dogs more enjoyable for everyone." In the survey of dog owners, the top three most appealing dog-friendly features were found to be a clip-in harness hook (81 percent), a non-spill water dispenser (74 percent) and a slide-away dog ramp (55 percent). "Everything that we built into the Rogue Dogue project is actually very possible to add to a production Rogue, though you do compromise the available rear cargo area slightly for the ramp, storage compartments and the food and water dispensers," said Dennis McCarthy, owner, Vehicle Effects, Sun Valley, Calif. "But really, next to your family, your dog is your most important cargo, so why not?" Bunce added: "More than 75 percent of dog owners in the survey said that having optional features specifically designed for their dog's safety and comfort would impact their decision on which vehicle to purchase. So potentially, every dog might have its day - and their custom-equipped Nissan Rogue, too." The Rogue Dogue is based on a 2017 Rogue SL with the Platinum Reserve Interior Package, featuring premium tan leather-appointed seats with special quilted leather inserts. The Nissan Rogue, following three straight years of sales growth since the introduction of the completely redesigned second generation for the 2014 model year, takes another major step forward for 2017 with a new look, enhanced utility and an expanded suite of available Nissan Safety Shield technologies. Rogue is now Nissan's top-selling vehicle. In an expansion of the Rogue lineup, a new gasoline-electric hybrid powertrain - available in two grade levels and a choice of front-wheel or all-wheel drive - is offered for the first time in Rogue history. A new Rogue Sport model - which is slightly smaller, sportier and more affordable than Rogue and designed for younger, urban SUV buyers - goes on sale at Nissan dealers nationwide in spring 2017. For more information about the Nissan Rogue, click here or contact us by completing the form below.